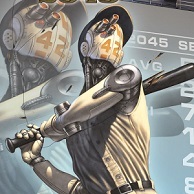 Baseball Highlights 2045 is a card drafting/deck building card game with a futuristic baseball theme designed by Mike Fitzgerald and published in 2015 by Eagle-Gryphon Games. The digital app version is developed by Peter Kossits and is currently available for Android tablets, with versions for phones and iOS coming soon. 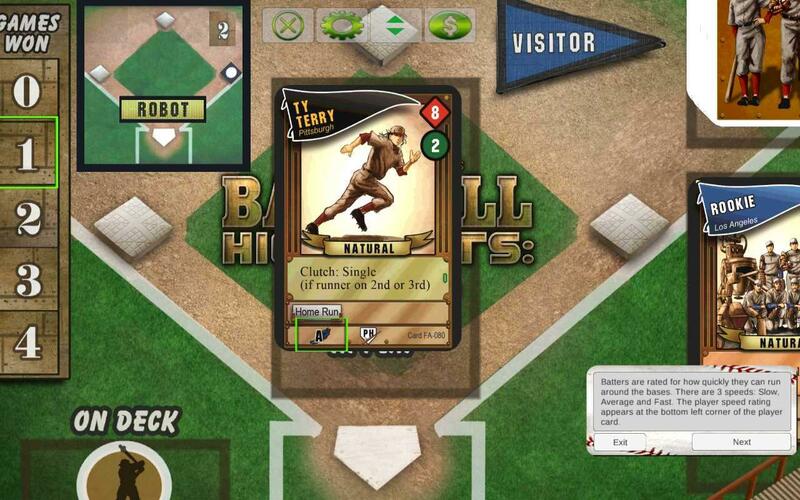 Baseball Highlights 2045 is a card drafting and deck building card game based on a futuristic version of baseball. The story goes that in the future the popularity of baseball as a spectator sport had began to falter and so in an attempt to revitalize the game it was shortened to six innings, and players were upgraded with cybernetic implants or replaced all together by robots. The game begins with a drafting phase where players spent allotted points to purchase player cards from their teams pool to replace some of the default ones on the team. Each but awards a certain number of points to be used in the next rounds buy. Once drafting is complete, the team cards are shuffled and 6 of them are drawn into the players hand. 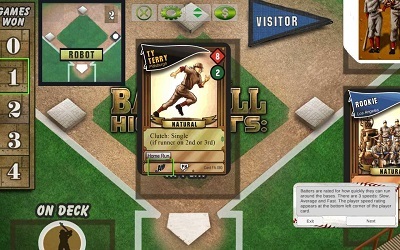 In each of the six innings, the player will play one of the cards from the hand out to the field. Most cards have to effects, one immediate and one that occurs on the next turn. Then the second player will play one of his six cards in response to what the first player played, potentially mitigating the second effect of the card that the other player played. This proceeds back and forth for the 6 "innings" (turns) of the game. Scoring occurs when cards are played that put runners on the bases that are able to run the bases into home as in real baseball. These six inning games can be chained together into series's with the drafting phases contributing to an over-arching meta game. There are additional mechanics which allow cards to be held in reserve "on deck" to be played at strategic times. The drafting and deck building aspects of the game are solid and the baseball diamond play fields add a unique board game aspect to traditional card play. The back and forth nature of the card play creates a very interactive experience giving players a chance to react to the others plays. Fans of baseball will appreciate some of the references and in-jokes used in the cards theme and player names. Non-baseball fans who enjoy drafting and deck building will not be thwarted to badly by the theme as it adheres very loosely to the actual game of baseball and will need to learn how a few baseball themes relate to actual mechanics in the game. The physical board game version of the game has been pretty successful and has spawned several expansions that the app developer plans to begin implementing into the digital version in the future. The app version features 60 unique free agents and four 15-man starting teams, an integrated rule book, an interactive tutorial and artwork from the original game. The developer has announced plans to continue to upgrade and improve the app adding features like phone compatibility, upgraded graphics, expansions and possible online multiplayer.